Corporal punishment works, but only on some children.
" I grew up in an almost totalitarian household which associated strongly with strict corporal punishment. My father showed very little love and my mother was mostly a screaming siren. Now that I think about it, it was because my father was in the army. He was a warrant officer who had a reputation of scolding and breaking down grown men into tears. He used to scold and cane me all the time. I hated it. I even ended up in the hospital twice. He would never let me stay outside for too long by myself or with friends. When I was in primary school, I had to be home by 7.15pm or else I wouldn't be given any dinner. He would sit there and eat; we would only get to do so at 9. He would beat me and scream at me when I was out of line. Basically imagine growing up in the army from young but instead of doing push ups or running, it would be the receiving the fist or cane. Of course, today I still resent him. But not as much as you think. Looking back now, I realized that everything he did, he probably had reasons, but was it unreasonably harsh? Yes, I do think so, but was it out of sheer anger? No. I resent him not because he punished me, but because the severity did not fit the crime; I once received 10 stokes of the cane because I failed my spelling. Just a f**king spelling test. I feel that behaviour and morals wise, I turned out better than most of my secondary school classmates. I didn't end up a delinquent. But I did turn into a socially awkward person with zero social skills. But I'm trying to learn; I'm better than I was a few years back, but I'm still lacking when it comes to interacting with large groups of people. I think what made me resent him less was the fact that I'm am now spending so much time away from him. Previously before secondary school, I would see him everyday, during secondary school I would rarely see him on weekdays and only on weekends because he decided to run a hawker stall with my mother. And when I started my part time job in ITE, I would only see him every Saturday morning and afternoon before heading to work. 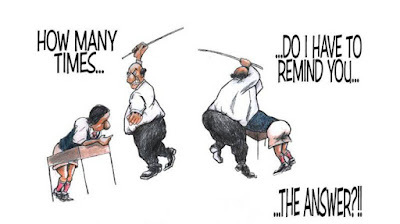 Does corporal punishment work? Yes, only on some children. Is it good? No. If I had kids would I ever use it? No." THANK YOU PROBABLY_DAYDREAMING FOR ALLOWING US TO REPRODUCE YOUR POST.